As September is coming to a close I look at the date of my last blog entry and see that I’ve gone two and a half months without returning to my first and certainly favorite writing venture. Unfortunately, it has been a sad summer, the sudden loss of my grandfather to whom I was very close has left me in no mood to write. I have discovered with regret that there are certain moments when not even music can lift my spirits. As the summer came to a close and I had to return to writing there were many other pressing projects to get to first, before I could make time for my blog. My second novel was behind on the word count and my most recent project, debuting comic book series Fairytale Therapy (Terapie de Basm in Romanian) was nearing its deadline. Now, with autumn having a firm grasp on the calendar and with this crazy summer behind me I can return to my first writing love, The Music and Myth. There is an interesting record I’ve been planning on writing about for months and I am glad I am finally able to get to it. That record is Iva Bittova, released this year by the Czech singer and violinist of the same name. It was released on the highly respected Manfred Eicher-label ECM, and that comes as no surprise since it sounds entirely like something the legendary German producer would love to attach his name to. I have always had a deep admiration for musicians who just disregard what everyone else is doing and go out there and do whatever the hell they feel like. Same with Iva Bittova. This lady is a hoot, her music is unlike anything you’ve heard before. Just look at this video properly titled “Iva Bittova – A Strange Young Lady”. It basically sums up what you will get out of an Iva Bittova recording, not to mention a live performance. I’ve discovered her newest release at the start of summer and fell in love with her music and unique type of performance from the first moment. Ok, I admit, it was actually from the second moment, the first moment was reserved for figuring out just what the hell to make of this strange music (and keep in mind I listen to Tom Waits and John Zorn). That being said this isn’t Andre Rieu or Nigel Kennedy, her avant-garde approach is certainly not for everyone, though her mastery as a musician cannot be disputed. 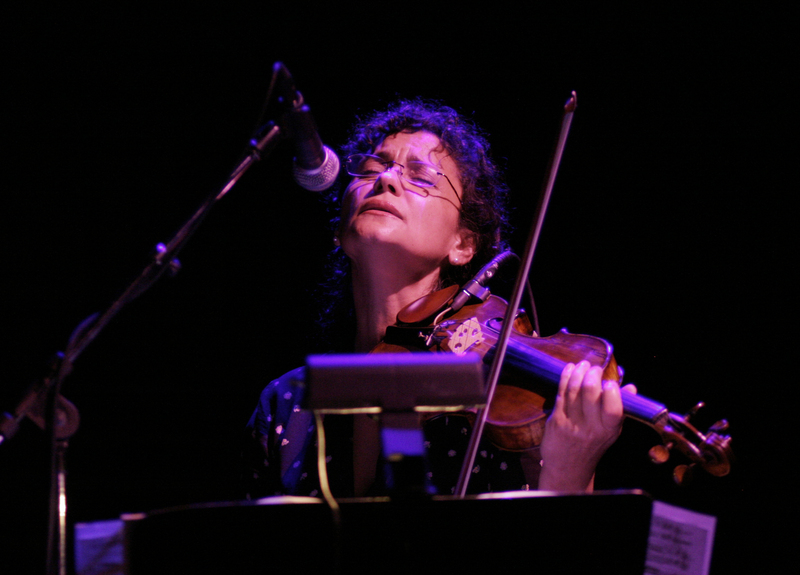 She is like the female, violin-playing version of guitarist Marc Ribot. She has a very interesting, dynamic and open approach to sound which, if exposed to an open mind, can make the listener feel intimately involved in her performance. Her solo record (and by that I mean there are no accompanying musicians) consists of twelve songs (all titled Fragment I-XII) and they all feature the eccentric Iva on vocals, violin and kalimba (thumb piano – because why the hell not). From the first track – or “fragment” – you are lured into Iva’s world by the sound of said kalimba which appears to have been thrown in there randomly but which works to perfection; its gentle sound, like raindrops, in combination with Iva’s sonance are perhaps the most conventional sounds on the whole album and do a great job of not scaring off the first-time listener. The track directs attention to Iva’s voice and it takes little time for a listener to bond with the imaginative way in which she uses it, alternating from regular singing to all sorts of chirping and cooing noises. On “Fragment II” we are introduced to the violin. At first, compared to the kalimba on the first track, the sound is almost dissonant, somehow threatening and loaded with tension, promising an aggressive musical explosion that never happens. It sounds like her voice is trying to escape a prison represented by the sound of the violin. I know that sounds crazy but it is the type of visual sensation that Iva Bittova’s music will evoke and that, in itself, is a rare treat. The tone shifts completely in Fragment III, where Iva’s singing and her violin playing are in tone with one another, producing an almost humorous result with constant shrieks and changes of tempo, in voice and violin alike. Her English lyrics, purposefully difficult to understand, add to the comical effect of the track though it is almost a threatening comedy, like the hysterical laugh of a madman. As the record progresses a listener will discover that the humor is not accidental, as it appears to be an integral part of Iva’s music, especially in her live-performances (though her affiliation with ECM has significantly toned down that aspect, presumably in order to keep her in the vibe of the legendary label). In “Fragment IV” the tense comedy vanishes, leaving in its place a very serious very beautiful and almost mournful chant. It is with this structure-pattern that the album continues as the tone of the fragments switches from playful but at the same time somewhat melancholic, with tempo-driven tracks like Fragments VII and XI to somber incantations (Fragments V, VI and X) where Iva’s versatile voice takes center stage, or tracks that highlight her talent and excellent timing as a violinist (Fragment VIII and, again, Fragment XI) . Yet, my favorite track has to be Fragment IX, with its clever use of the kalimba as (almost) a percussion instrument that accompanies Iva’s interesting voice; a voice that is, most of the time, overshadowed by its own liveliness. But make no mistake; hers is a powerful and educated voice that the singer purposefully chooses not to flaunt and instead, to use only as much as a certain song requires – a display of admirable musical wisdom (think back to Mark Knopfler purposefully not including prolonged guitar solos on his latter, more ripe, work). I’m a fan of the way in which the tracks are open to interpretation, offering just enough material to stimulate the listener into using his or her imagination and connecting the dots. In music, as in literature, leaving a few “empty” spaces and structuring the product well is a sign of good storytelling. It is interesting that “Iva Bittova” cannot be thought of as a violin recording and neither a vocal Jazz recording as we might have expected glancing upon the letters ECM. Instead, the backbone of this album is represented by the way in which Iva’s voice relates to the sound of her violin, you almost feel like her voice is an instrument shaped by her trance-like reactions to the sound of her violin and vice-versa. She is always aware of her surroundings making her delivery as important a factor as the art itself. In fact, my only minor gripe with the record is that Iva’s personality seems a bit more toned down than in her quirky live performances, again an aspect probably planned in order to better fit the ECM canon. Other than that: a good, well thought-out record, sometimes eccentric and playful, sometimes somber and reflective, always delicate. But do let me repeat: this is not Andre Rieu playing Johann Strauss. If you are interested in song and melody you might best skip this one but if you are interested in music, well, in that case it comes highly recommended.